From Capri we took the ferry to Positano, and it was so beautiful coming into the town from the water! We stayed at the most gorgeous hotel that has been on my dream list for awhile, Le Sirenuse, and it was such a magical experience - The hotel is located right on the top of the hill overlooking the ocean & the town, and their restaurant (which you can visit even if you are not staying there) has the most amazing view of the beach as well - It looks like a postcard come to life! For our first day, we really didn't leave the hotel - We enjoyed the pool (my favourite part was the live lemon trees along the side - so beautiful!) 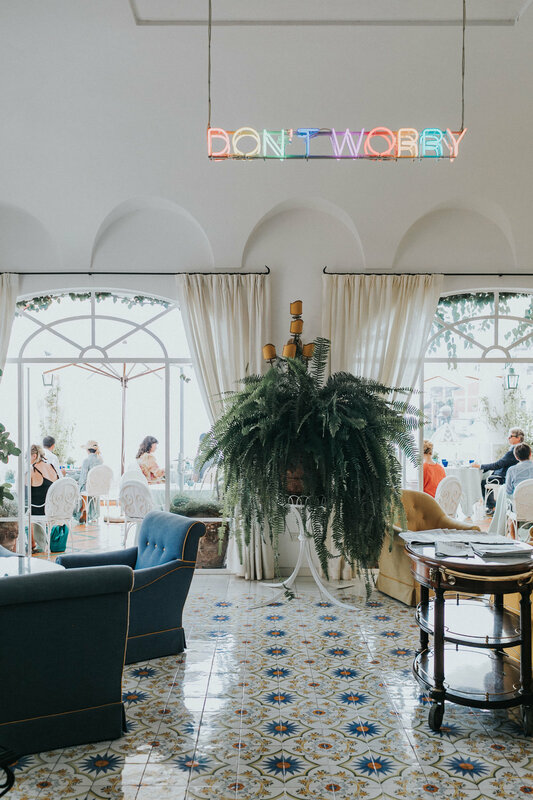 where we sipped on Aperol Spritz and took in the Italian sunshine. We ate at the restaurant (the Ravioli is so amazing, we had it everyday we were there!) and finally we did head out on the boat ride the that they arranged for us to see Positano from the water for sunset...It was just breathtaking! You can definitely visit the hotel even if you don't stay there, and I highly recommend it, they have the best view of Positano and it is just a beautiful space - especially for Instagram photos!